Baking these meatballs allows the panko/parmesan to form a nice crunchy brown crust, and the mayonnaise keeps the meatballs from drying out. 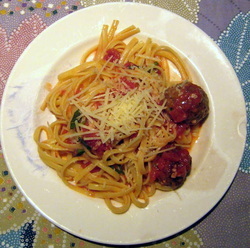 Simple Tomato Spaghetti Sauce completes the meal. Pre-heat oven to 350 degrees. Mix everything together and form golf-ball sized meat balls. Put meatballs on a broiler pan and bake until browned, about 35-45 minutes total, turning them once in awhile to get them a uniform color. Serve with Simple Tomato Sauce and your favorite pasta.